Cold weather and low humidity levels result in dry air, which then steals moisture away. Without immediate care, dry skin can lead to cracking and bleeding and the harsh wind makes the problem worse. Indoor heat further robs the air of moisture, as do hot showers or baths and harsh cleansers. Additional moisture helps, but you need to do more to actually counteract these effects and keep skin looking youthful and smooth. To reduce chapping, redness, itching and keep skin more health and comfortable this season, try these tips. I know, I know hot, steaming showers feel amazing in the cold weather months but when you can particularly when just washing your face or hands, choose lukewarm water to avoid stripping as many oils away from the skin. If you haven’t tried our Purple Brazilian Clay or Activated Charcoal facial soap bars now is the perfect time as it doesn’t strip your skin of it’s natural oils but it helps naturally moisturize with Apricot Kernel oil and Meadowfoam seed oil. Applying moisture to damp skin helps seal that dampness into the skin. Keep a jar of our Acai Berry with Argan & Perilla seed oil body butter next to your bathtub, shower stall and use liberally every time you wash. Avocado oil is the first ingredient in our body butter so you know we mean business when it comes to skin moisture. Ok so while I can only hope you are using our Acai Berry with Argan & Perilla seed oil body butter I do want to give you tips on picking out the right moisturizer. They are not all created equal. Some over-the-counter moisturizers have petroleum-based ingredients that can actually further dry your skin in the winter months. Be sure to choose a smart formula that has natural, nourishing ingredients. Going for an oil-based rather than a water-based solution is best for getting that deep moisture. Fun fact, I picked up knitting because I love the craft and even more importantly love being stylish while protecting my skin from the cold months by wearing gloves and scarves. While learning to knit is not necessary protecting yourself is! It’s true heating systems can dry out the the air so consider installing a humidifier in your home to put moisture back into the air and help prevent your skin from drying out. Don’t forget that your skin needs hydration from the inside, out. Hot cocoa, coffee, tea and cocktails aren’t enough it’s important to hydrate with good ole H20. Often times we forget to help the skin slough off dead cells in the winter months. It’s important to remember moisture can’t get in if the dead cells are too plentiful. We recommend using our Acai Berry with Sea Buckthorn oil Body Polish twice a week to help slough off those dead skin cells so your bright skin can shine through. 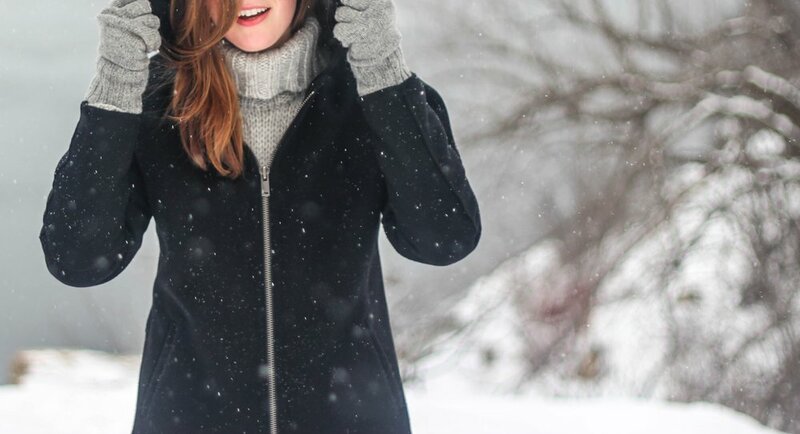 Do you have any other winter skin protection tips? If you do share them below!